President Obama gave the State of the Union address on Jan. 25, 2011. 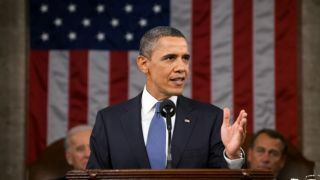 President Obama's State of the Union address last night (Jan. 25) outlined an ambitious roadmap for the country in terms of jobs, industry, education and energy policy. But his lofty goals for the future also echoed the sentiments of the U.S.-Soviet space race of more than 50 years ago, with the president calling today's challenges "the Apollo projects of our time." Obama likened America's current need to advance research and innovation to the famous race between the United States and what was then the Russian-led Soviet Union for supremacy in space exploration. "Half a century ago, when the Soviets beat us into space with the launch of a satellite called Sputnik, we had no idea how we would beat them to the moon," the president said. "The science wasn't even there yet. NASA didn't exist. But after investing in better research and education, we didn't just surpass the Soviets, we unleashed a wave of innovation that created new industries and millions of new jobs." Obama urged the country to work together to overcome adversity, saying "The challenges we face are bigger than party, and bigger than politics." The United States, Obama said, stands at a crossroads. "This is our generation'sSputnik moment," he said, referring to challenge that was presented to the U.S. in 1957 when the Soviet Union launched the world's first orbiting artificial satellite, Sputnik 1. "Two years ago, I said that we needed to reach a level of research and development we haven’t seen since the height of the Space Race. And in a few weeks, I will be sending a budget to Congress that helps us meet that goal." "We’ll invest in biomedical research, information technology, and especially clean energy technology – an investment that will strengthen our security, protect our planet, and create countless new jobs for our people," he added. NASA chief Charles Bolden promptly said the space agency is ready to do its part. "Tonight President Obama delivered a powerful State of the Union message to the nation," Bolden wrote in a blog posted on NASA's website late yesterday. "His focus on innovation, education and building are the foundations for our future success as a nation – and the key to economic recovery and long-term fiscal stability." While Obama did not specifically refer to his administration's space plan for NASA (one aimed at landing astronauts on an asteroid by 2025 and Mars in the 2030s), his mention of the agency's role in building up the country's scientific prowess was significant, some experts say. "The last time that NASA was referred to by name in a State of the Union address was more than two decades ago, in 1989," said Robert Pearlman, editor of collectSPACE.com, an online publication and a community for space history and artifact enthusiasts. "President Obama's reference to NASA wasn't specifically about his goals for the space agency, but he used it as a positive example as to why the nation needs to invest in research and development, which in and of itself was a cornerstone of the president's plan for NASA," Pearlman said. "The current state of NASA may not be a point of pride for everyone, but it does say something that the space agency had a place in tonight's State of the Union." Bolden compared Obama's speech to John F. Kennedy's in 1961. "Fifty years ago, another young president propelled a fledgling space agency on a bold, new course that would push the frontiers of exploration to new heights," Bolden wrote. "The 21st-century course that President Obama has set our agency on will foster new industries that create jobs, pioneer technology innovation, and inspire a new generation of explorers through education – all while continuing our fundamental mission of exploring our home planet and the cosmos." Obama also spoke about improving the nation's education, saying, "We need to teach our kids that it's not just the winner of the Super Bowl who deserves to be celebrated, but the winner of the science fair." Fostering education, Bolden wrote, is a key goal at NASA. "We're making contributions in all of these areas," Bolden wrote yesterday. "Tonight's message of opportunity and inspiration will guide us as we reach even higher, building a better tomorrow and ensuring that we win the future for this generation and generations to follow."